In the meantime, I just wanted to let everyone know that I’ve updated my upcoming events page, which is on the side bar of the news page. It has all my signings for RENEGADE for the rest of the year. REVELATIONS signings are still being scheduled and I’ll get those listed as soon as I get confirmation from my people. (He, he. I’ve always wanted to say that.) If you want me to come your way, click here to vote on your city. The more votes for your city, the better chance I’ll be able to go to sign REVELATIONS. However, there IS one big event I wanted to make sure you all knew about, because I’m completely honored to be a part of it AND because I have awesome news regarding this event. The HOUSTON BOOKRAVE!! It takes place the weekend of November 1st in Houston, Tx. Click here for more details. However, the awesome news is that if you’re going, I’ll be signing early copies of REVELATIONS since it doesn’t technically come out until November 5th! AND if you can’t make it, you can order signed copies of RENEGADE and REVELATIONS here. Anyway, thanks again to all my readers. You make my job awesome and I love you for it! REVELATIONS is coming your way! As many of you know, REVELATIONS (ELYSIUM CHRONICLES book 2) release November 5th and I’d like to know where YOU want me to go for signings. So please fill out the form below and tell me. If I get enough responses for a particular city/state, then I’ll come to visit you. So, if you really, want me to come to your area, make sure to send all your friends to sign the form! 🙂 As soon as I have a list of places I’ll be going for my release “tour,” I’ll post it. Speak up: Comments Off on REVELATIONS is coming your way! I’ll post them on the “fan art” page on my website (with credit to you, of course.) And I’ll feature some of my favorites on my blog in their own post. To sweeten the pot, I’m giving away a sweet prize to the top three winners. The grand prize winner will win an ARC of REVELATIONS (when available), the 2nd and 3rd place winners will win a gift card to Amazon/Barnes & Noble. This contest is open internationally. Contest ends April 5th. And, as an FYI, if you’ve read and reviewed RENEGADE get those links ready. I’ll be hosting a reviewer appreciation giveaway soon. There is a lovely prize associated with it that I’ve had commissioned just for this occasion and I can’t wait for you guys to see it. I just want to get it in my hands before I announce what it is. A HUGE thank you to everyone who entered, shared, and/or otherwise made my latest cover reveal a success! A huge thanks especially to the bloggers who managed to fit me in at the last minute. I couldn’t have done it without you, so THANK YOU!! Also, I have huge amounts of gratitude to the three people who gave me the most beautiful cover EVER! My editor for helping figure out what I wanted to see on the cover, Sean the art director at Tor for taking my horrible notes of what I wanted and making sure it came to reality and knowing exactly how to make my covers stand out and POP, and to the cover artist herself, Eithne OHanlon, for somehow being a mind-reader and giving me the most gorgeous cover ever. No words can express how thankful I am for your awesomeness. In case you missed the awesome cover or if you’re like me and just want to stare and drool at it some more, I’m posting it below. Isn’t it “just about perfect”? Just like the first cover, there’s so much going on here beyond just what we see and I can’t wait for people to read it to see what’s there. But I LOVE that it’s not the fairytale-ish look that the first cover had. That it shows what Evie went through in the first book and it’s dirty, and gritty. That she’s peaceful, for now, but the storm clouds are rolling in. It’s just…perfect. I couldn’t be happier with this cover. What do you think? I’d love to hear your thoughts in the comments! And now onto the part you’ve all been waiting on. The winner of the cover reveal contest! They can be found in the rafflecopter widget below. Congrats to you! Please email me at j.souders (at) jasouders (dot) com with your address and to let me know if you want your signed copy of RENEGADE personalized. Sunshine Tour Stops, Freebies, and Signed books. Oh my! Hi wonderful people! 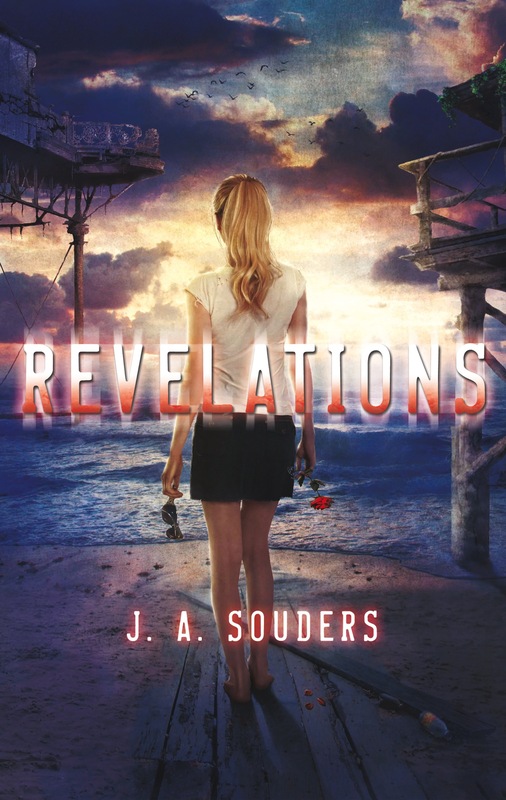 I hope everyone has had a chance to see the lovely new cover for REVELATIONS! If you haven’t, make sure to check out this post. There’s a list of blogs on that page that hosted my cover reveal and all of them have the rafflecopter widget to enter to win a bunch of signed books INCLUDING the ARC to REVELATIONS when it comes out. I’m superexcited to announce that the Sunshine Tour is coming to Orlando and Tampa/Clearwater. But WAIT! if you aren’t in Florida or near these areas, keep reading, I promise it’ll be worth it. Anyway, the Orlando stop is going to March 2nd at the Winter Garden Barnes and Noble. We’ll each be doing a short talk (panel form) and then signing our books. See flyer below for more information. The Tampa/Clearwater stop is going to be at the Clearwater Barnes and Noble (Flyer to come shortly). Again a short talk and then signing of our books. To tempt you all to come on out on what promises to be a really pretty weekend, I’m offering a bunch of goodies that you can only get at the signings. Among some special SWAG, I’ll be giving away signed posters of the new REVELATIONS’ cover and RENEGADE’s cover and free e-copies of A DARK GRAVE (that will work on all e-readers). Also, possibly a sneak peak at the next Elysium Chronicles short story. And if you can’t come, there’s still an option to get signed copies of all the books from the authors on the tour. All you have to do is go here and fill out the form. More details at that link. I’m so excited to be on this tour and I can’t wait to see you at the stops!